A few years ago, my wife and I went on safari in Kenya. 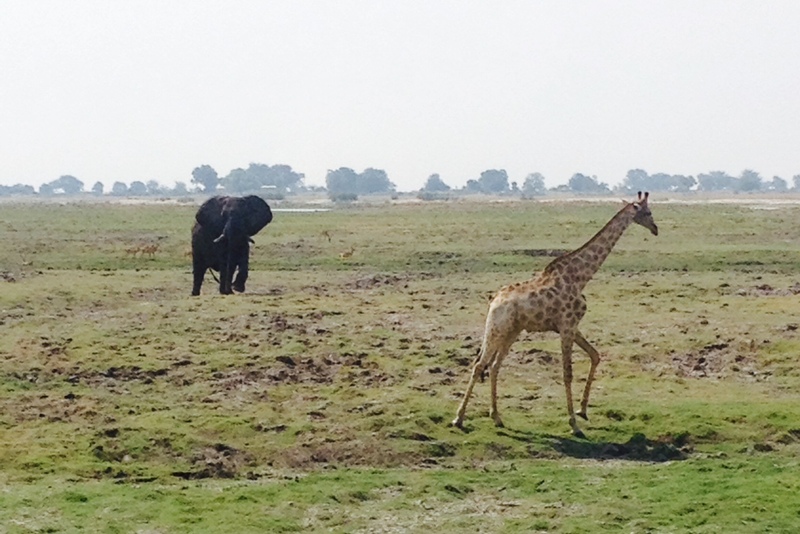 While watching lions, giraffes, water buffaloes, elephants, and other animals I remember thinking, “I really want our children to experience this!” As part of our round-the-world family sabbatical, we included a safari in Chobe National Park in Bostwana. 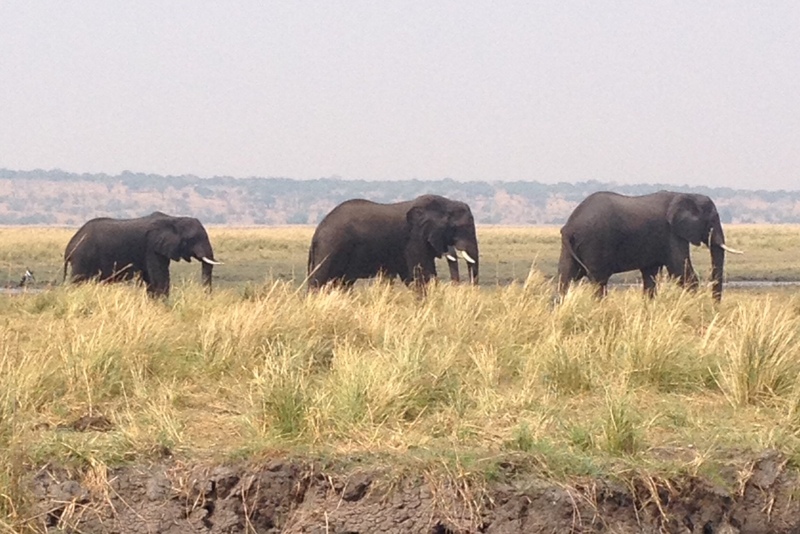 Chobe is best known for elephants, and we saw lots of them, but there were plenty of other animals to see. We drove about 70 kilometers from Livingstone, Zambia, to the border with Botswana, went through customs, jumped in a small boat to cross the Zambezi River, and continued to Kasane, Bostwana. Our safari included two boat rides on the Chobe River, several game drives in the Chobe National Park, two nights sleeping in tents, and five or six scorpions at our camp site. After arriving, we boarded a boat with our captain named Captain (no kidding). 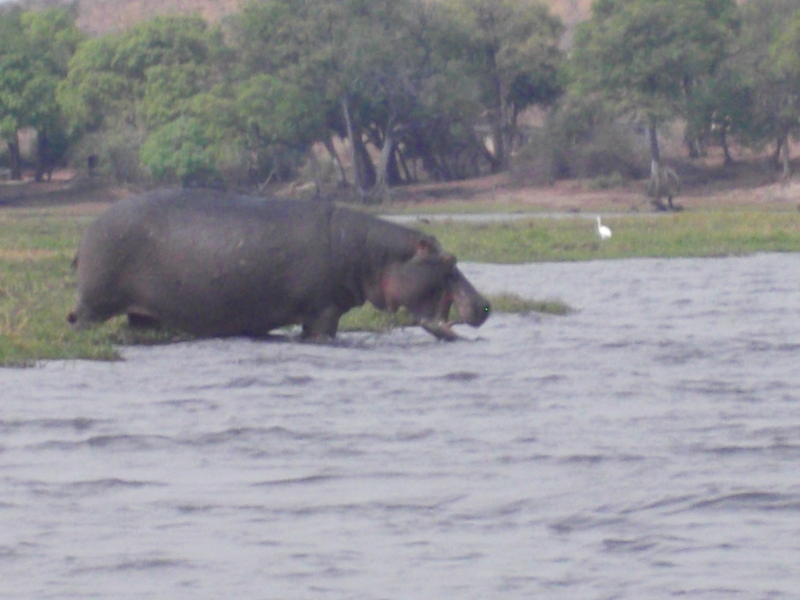 On the Chobe River, we saw lots and lots of animals up close: elephants swimming across the river, hippos marking their territory (it’s both fascinating and rather gross to watch), crocodiles sunning, water buffaloes grazing, and lots of birds catching fish. 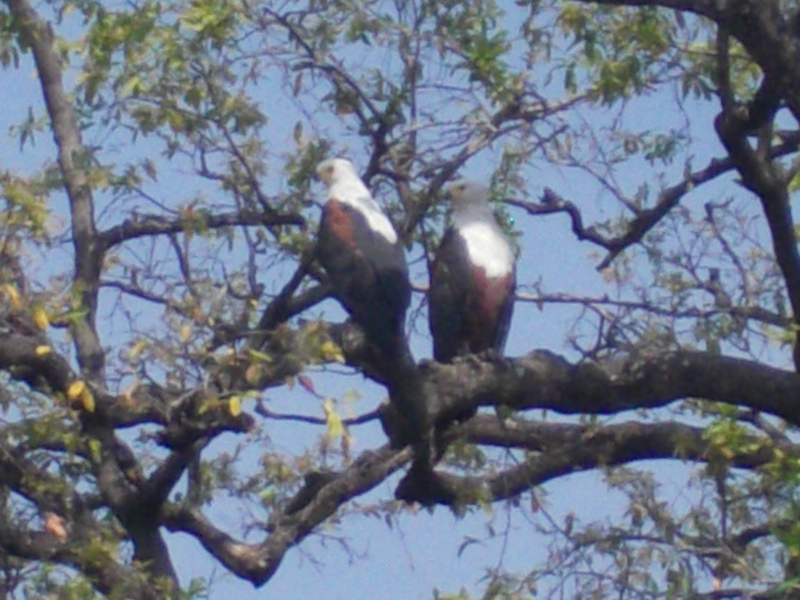 We were especially pleased to see African Fish Eagles, birds that look very similar to the American Bald Eagle with dark feathers and white heads. The birds mate for life, and we saw pairs of them in their nests and flying over the river. The fish eagle has a distinctive call, sometimes called the Sound of Africa, and we were delighted to see the birds and hear their call. After our boat ride, we climbed aboard our cruiser with Sinka, our driver and guide. Sinka was a gregarious man with an easy laugh, gentle spirit, and uncanny ability to spot animals. During our first afternoon, Sinka helped us find a leopard by driving slowly around the back of bushes to a shaded area where he thought the leopard might be resting. As we turned, there it was! We gasped in delight to see the big cat. 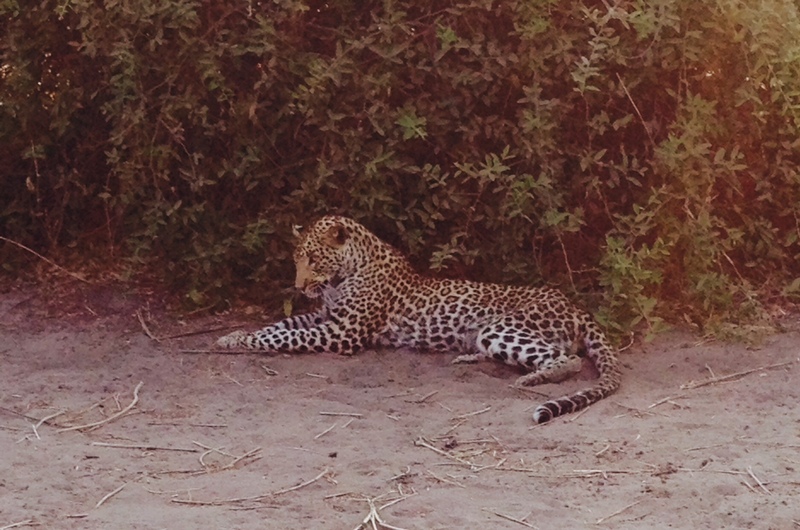 On our second day, we watched another leopard stalk a wart hog before giving chase. The wart hog eluded the leopard and lived another day. Each day, as the daytime gave way to evening, we noticed the activity changing. Lions began to wake from their daytime slumber and prepare for the evening’s hunt. 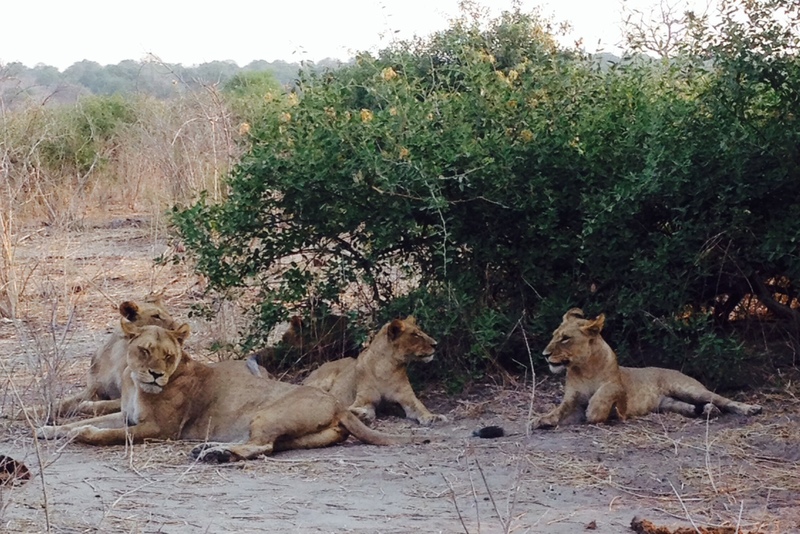 One evening, we spent a long time watching three lionesses with their cubs prepare to hunt. Gathering their cubs, the lionesses made their way to the river, took long drinks of water, and headed off to hunt as dusk fell over the land. 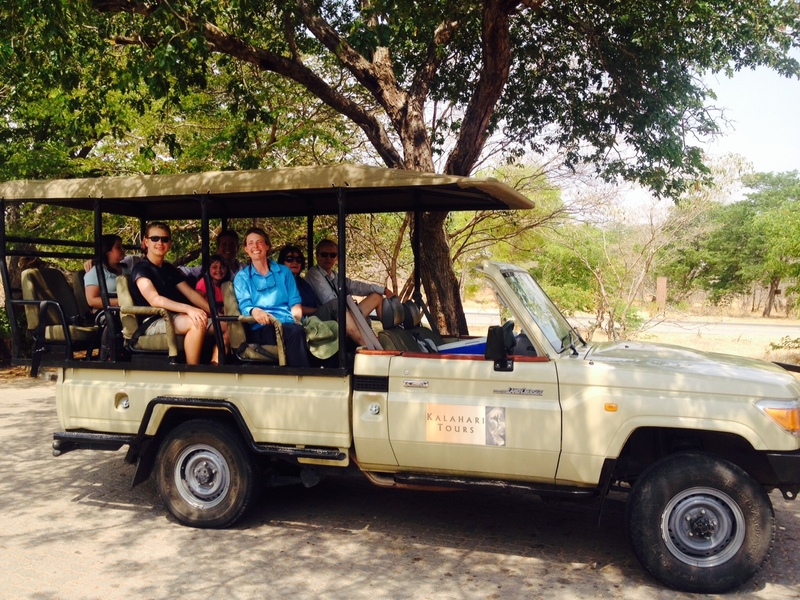 Going on safari amazed me the second time just as much as my first experience. This time, however, seeing the animals, listening to sounds from the bush, and sleeping in tents was more special because my wife and I shared it with our children. We still talk about the bachelor herds of elephants we saw — large groups of male elephants that have been forced out of herds with mothers and babies. And we still laugh about bouncing to and fro while riding in our open-air cruiser. Once again, I loved watching the animals and the beautiful scenery, but this time, I especially loved watching my children see and experience all of it. This entry was posted in Africa, Family Travel, Safari, Travel and tagged Africa, Bostwana, Chobe, Chobe National Park, Family Travel, Safari, Travel on November 15, 2014 by Dean Allen. Victoria Falls is known as Mosi-oa-Tunya, “The Smoke that Thunders,” because of the great cloud of mist that rises when the Zambezi River cascades over the falls at the border of Zambia and Zimbabwe. 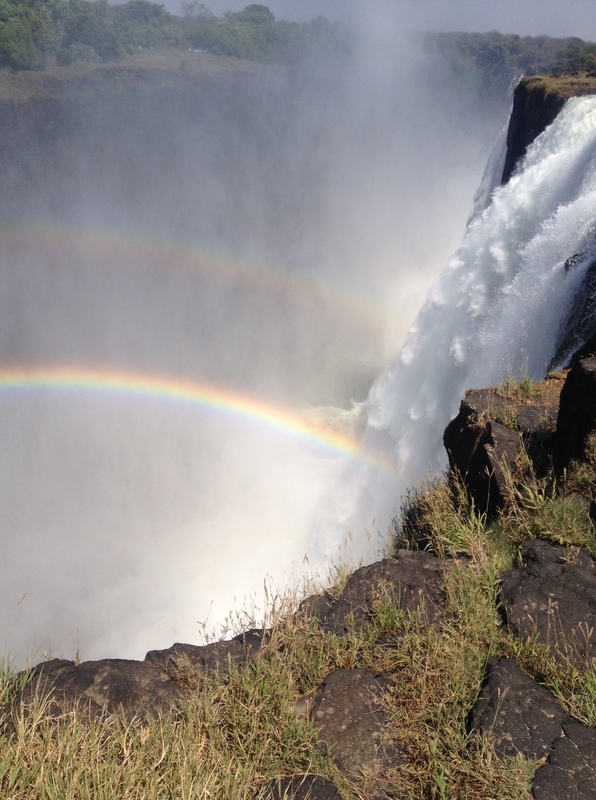 We visited Victoria Falls at the beginning of October during the dry season, which usually lasts from May to October. During those months, the Zambezi River slows, and much of the falls does not have water cascading over it. While this could seem disappointing, it actually makes possible a wonderful visit to the falls. If you visit Victoria Falls during the dry season, you have an opportunity to swim to the edge at Devil’s Pool. You can take a boat to Livingstone Island, and from there, you walk near the top of the falls before jumping into the Zambezi. Then, you swim — or more accurately you are pushed by the current — to the fall’s edge. Then, a natural rock wall stops you from going over the top of the falls. There, you can sit at the top of the falls, watch water rush past you as it goes over, and see rainbows formed by the mist. It is an amazing experience that is well worth the time, effort, and expense. After we finished our swim in Devil’s Pool and were safely back on land, we visited the Mosi-oa-Tunya National Park. A helpful guide took us on a walking tour of the falls, and because of the lower water level, we walked literally up to the edge. We stretched out on our bellies and looked over the top of the falls. Like swimming in Devil’s Pool, it took my breath away! So often we seek superlatives: the biggest, the best, the tallest, the greatest, the most. On my trip to Victoria Falls, I was reminded that something can we wonderful — even better — when it is not the biggest, the greatest, or the most. Had I visited Victoria Falls during the rainy season, much more water would have rushed over the falls. The spray would have been taller, and the roar louder. But, I would have missed the chance to swim in Devil’s Pool and found my heart thumping in the midst of the Smoke that Thunders. 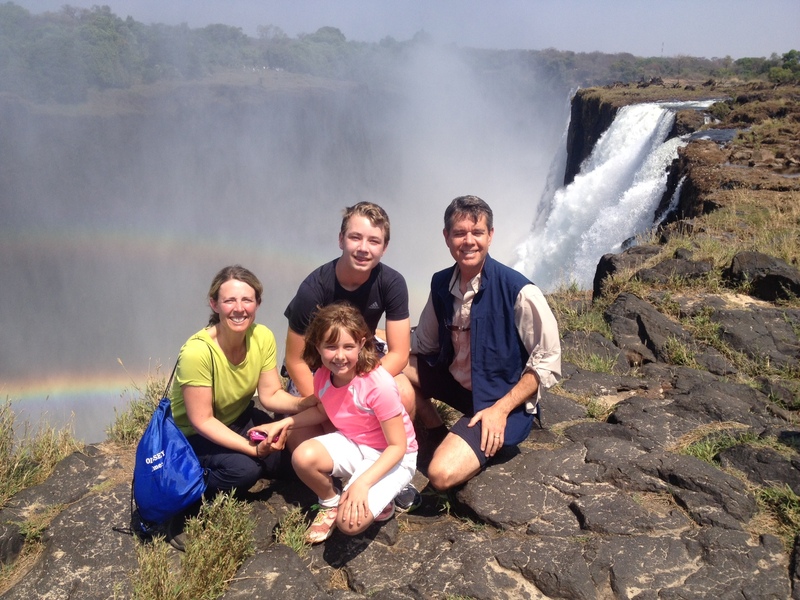 This entry was posted in Africa, Family Travel, Travel, Victoria Falls and tagged Africa, Family Travel, Travel, Victoria Falls, Zambezi River on November 12, 2014 by Dean Allen. We arrived in Venice after a long period of intense travel. After a fantastic time in Zambia and Botswana (more about those destinations in a future blog post), and ten wonderful but exhausting days in Palestine/Israel, we made our way to Italy. We had a deeply meaningful time in the beautiful city of Assisi, including Sunday mass at the Basilica of St. Francis, and three wonderful but also fast-paced days in Florence with our new friend, Alessandro Vannini, a Florentine artist. Then, we journeyed to Venice. We parked our car, took the water taxi into the city, and made our way to our apartment. And, we found a wonderfully quiet canal and square that was our home for three days of rest. It is estimated that thirty million tourists travel to Venice each year. Nearly all of them head to Piazza San Marco and the Doge’s Palace, and we also made our way there to join the crowds filling the area. Even in late October and early November, the area was packed with people. 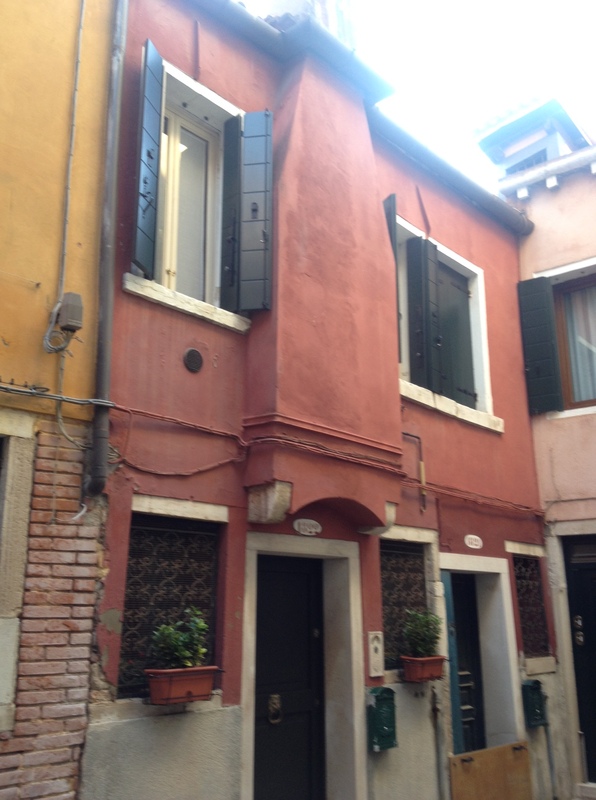 But we also retreated to our apartment in the San Croce neighborhood far away from the crowds, which proved to be the highlight of our time in Venice. We really enjoyed staying in Venice. It was beautiful and interesting in all the ways we expected. But unexpectedly, it proved to be a quiet and peaceful place to rest after an extended period of intensive travel. 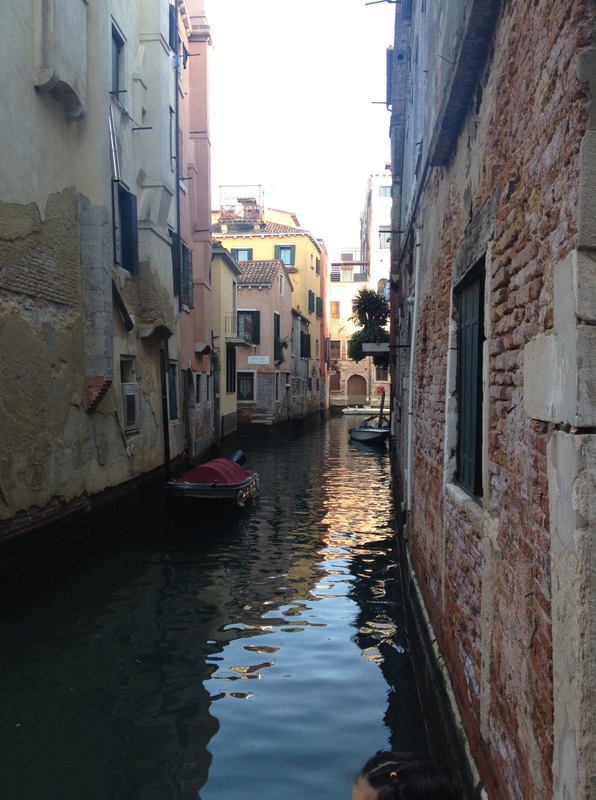 My favorite activities were walking around the quiet neighborhoods, especially after dark when street lights kept everything bright, and listening to water lap on the boats in the canal behind our apartment. If you have a chance to travel to Venice, go. If you like large crowds, you will find plenty of people to join. But, if you are looking for a beautiful and quiet place to be, there are many such spots in Venice. This entry was posted in Family Travel, Italy, Travel and tagged Piazza San Marco, Venice on November 8, 2014 by Dean Allen. Two events — unexpected and unplanned — happened during our long-term travel. We spent many days traveling in Palestine and Israel before heading to Italy. In Palestine, we spent time in Bethlehem where we saw Shepherds’ Fields, Manger Square, and the Church of the Nativity. 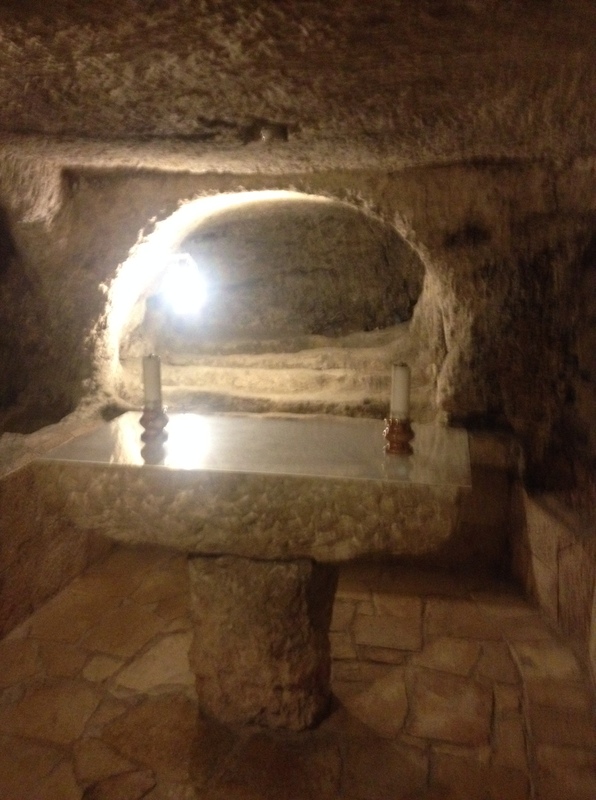 While in the Grotto of the Nativity, we joined other faithful ones remembering the birth of Jesus. About fifty women from Brazil were singing in the grotto, and the sound of their voices reverberated throughout the grotto while we visited. Numerous other chapels are located in or near the Church of the Nativity. One of these — the Chapel of the Innocents — commerorates the infanticide ordered by Herod after hearing about Jesus’ birth from the Magi. In the gospel of Matthew, chapter 2, we read that Herod ordered the death of children aged two and younger in Bethlehem. The slaughter of the innocents is a difficult, and theologically challenging, aspect of the gospel story. Under the Church of the Nativity, away from the Grotto of the Nativity with its crowds of pilgrims, the Chapel of the Innocents sat quiet and empty. Perhaps that was a fitting testimony. After leaving Israel/Palestine, we traveled to Italy. While in Florence, we made the rounds of important sites such as the Ufizzi Gallery and the Galleria dell’ Accademia di Firenze. While at the Accademia, I found an unexpected treasure. After seeing Michelangelo’s David, which at seventeen feet tall is incredible and awe-inspiring, I turned left to go into another gallery. There, in a room filled mostly with statues, a few paintings are on the wall. At the far end of the room, on the left side of the wall, I saw a painting that took my breath away. 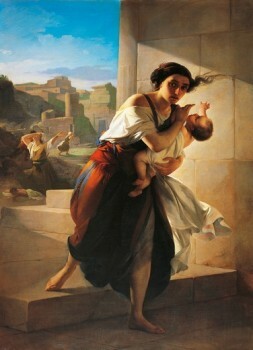 Antonio Puccinelli painted The Massacre of the Innocents in 1852, and in it, he captures the terror of mothers whose children are to be killed because of Herod’s order. In the background, one mother cries out in anguish over her dead child, lifting her hands raised to the sky. In the foreground, another mother carries her child away, covering his mouth to keep him from making noise and being discovered. Her face is filled with worry as she flees. Puccinelli (1822-1897), a Florentine painter, was best known for his realism. He depicted everyday scenes with special focus on regular people in normal settings. In The Massacre of the Innocents, Puccinelli captures the experience of a regular woman, a mother desperate to keep her child alive. After looking at the painting for a long time, I rushed to find my wife and encouraged her to see it as well. Then, together, we looked at this painting, marveling at its depiction of the scene in a way that neither of us had ever seen before. This entry was posted in Family Travel, Italy, Palestine, Travel on November 4, 2014 by Dean Allen. 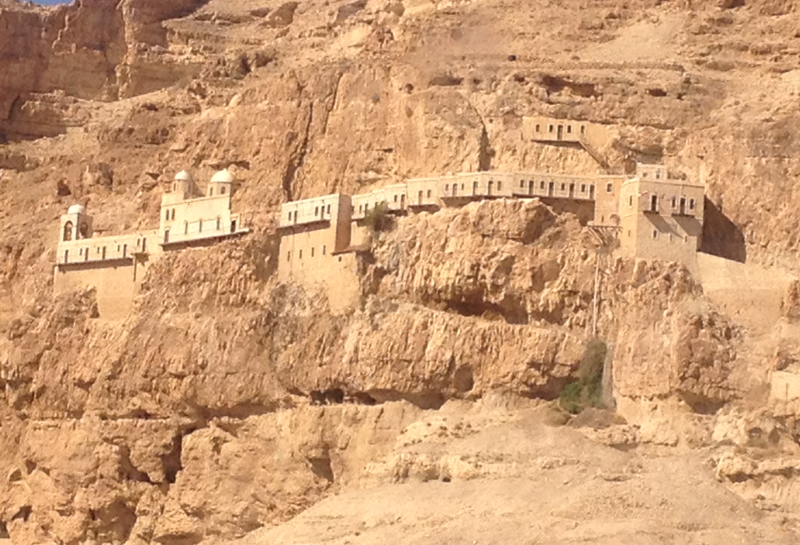 While in Jericho, we traveled up the Mount of Temptation to see the monastery on the site commemorating Jesus’ temptation in the wilderness. The trip is fast and easy today thanks to a cable car that whisks you up the mountain! Like so many sites in Palestine and Israel, caves provided the setting for important events. Mary likely was told of Jesus’ coming birth in a cave, Jesus may have been born in a cave, and Jesus taught his disciples in caves. The Monastery of the Temptation amazingly clings to the mountainside about 350 meters above sea level, and it encompasses caves in which Jesus is believed to have endured his temptation. 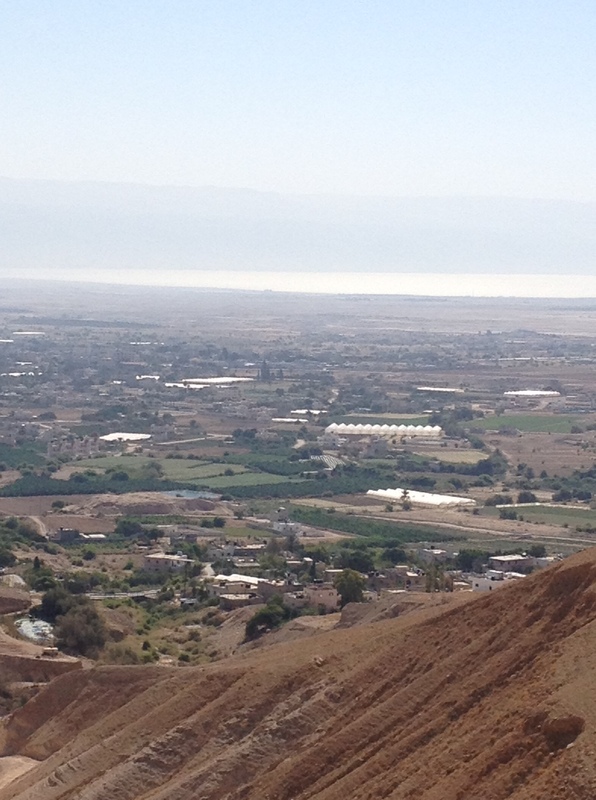 From the monastery, you can view the oasis of Jericho in the midst of the dry land surrounding the Dead Sea. It includes beautiful icons well worth seeing. 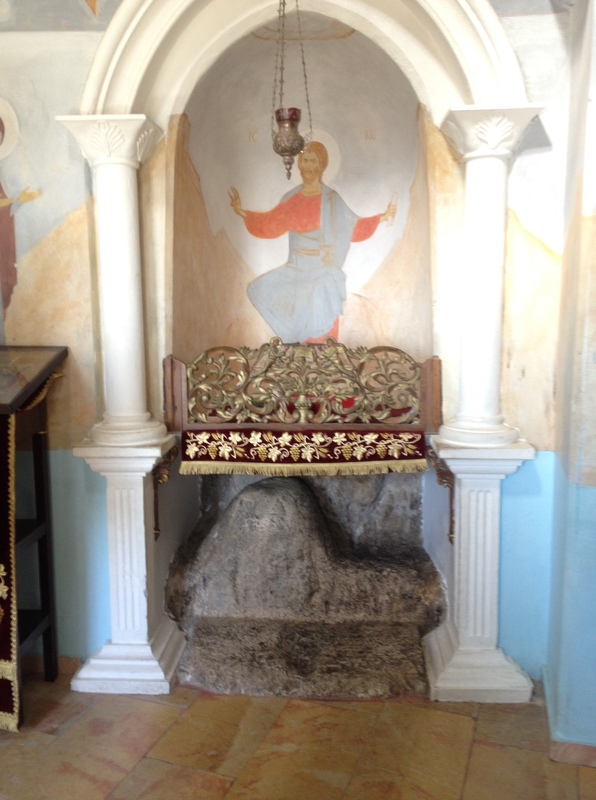 In one spot, pilgrims are invited to see a rock on which Jesus is thought to have sat while tempted. 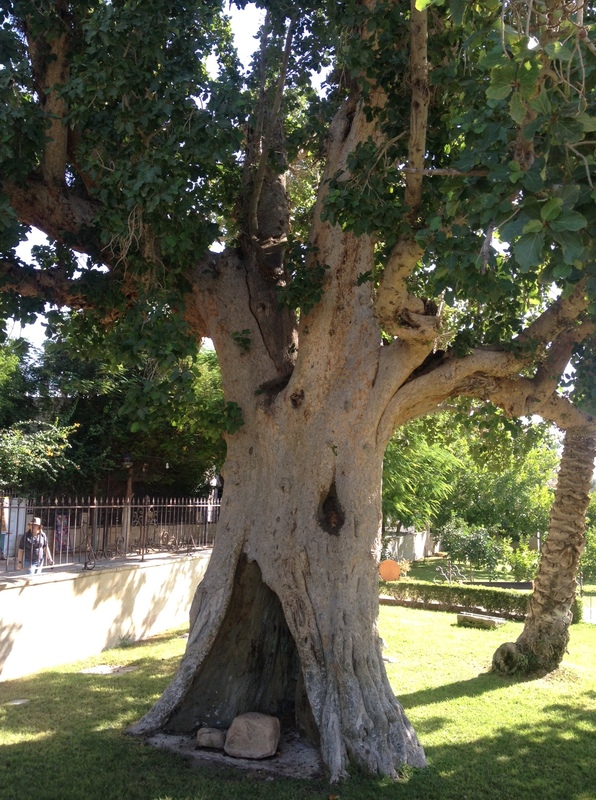 While in Jericho, we also stopped to see the old sycamore tree in town. As a young child, I remember learning the song about Zaccheus, the tax collector whose short stature required him to climb a sycamore tree to catch a glimpse of Jesus as he passed through Jericho. Zaccheus was a wee, little man. A wee little man was he. For The Lord he wanted to see. And when the Savior passed that way, He looked up in the tree. Visiting the tree reminded me of Jesus’ audacious willingness to fellowship with people viewed as sinful and despised by others. It also reminded me of the change brought about in Zaccheus. After his encounter with Jesus, Zaccheus gave half his possessions to the poor and restored four-fold any money he had taken wrongly from people. You may read this story in the Gospel of Luke, chapter 19, verses 1-10. If you have the opportunity, make the trip to Jericho. This entry was posted in Family Travel, Palestine, Travel on November 3, 2014 by Dean Allen. Like so many pilgrims to Israel/Palestine, we wanted to see Bethlehem and Jericho. Our time in these areas was wonderful because of our guide and friend, Naser Alawy, a native of Bethlehem. As we drove south from Jerusalem, Naser met us just before we reached Rachel’s Tomb and the check point to go into Bethlehem. He showed us where to park our rental car and ushered us through the check point. Then, we shared a deeply meaningful day in Jericho and Bethlehem. After working as a physical therapist in Spain, Naser wanted to return home. He graduated from the tour guide program at Bethlehem Bible College. I encourage you to contact Naser if you need a guide in these areas. His email address is NaserAlawy@yahoo.com. In addition to providing historical information and helpful driving, Naser also took us to a Palestinian restaurant for lunch, helped us choose special dishes, and shared a delicious meal with us. As our day ended, Naser accompanied us back through the check point and escorted us to our car. As I watched Naser walk back to his home in Bethlehem, I was both grateful for a wonderful day and sad to see a special man going to the other side of concrete fences and barbed wire. Part of the joy of travel includes seeing important places, but it is even more touching to meet wonderful, caring people. 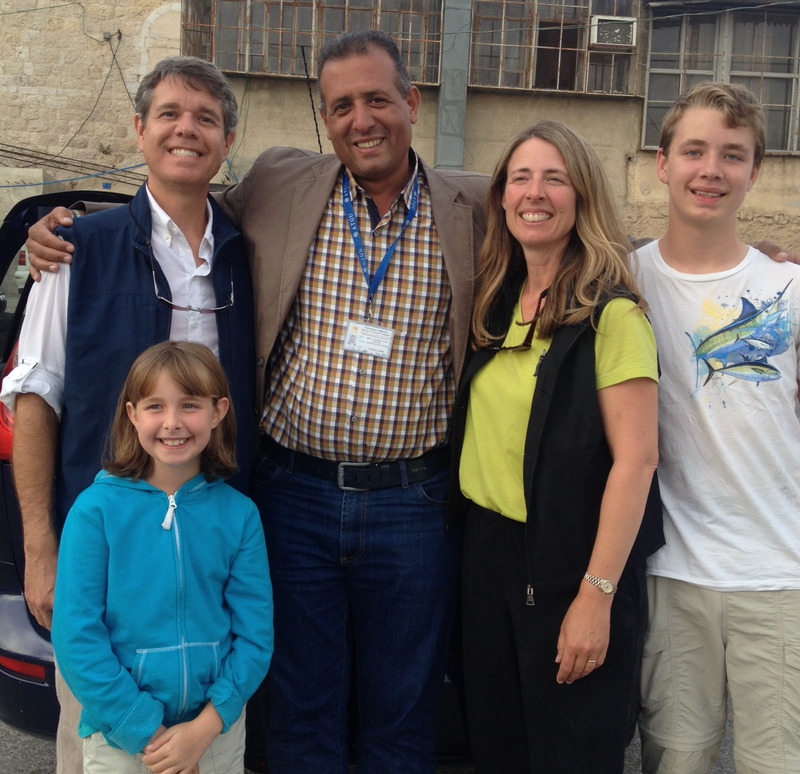 Naser is one of the special people we have met during our travels, and I feel that we have a friend in Bethlehem. I pray for his well being and that of his family, and I hope our paths will cross again. This entry was posted in Family Travel, Palestine, Travel and tagged Bethlehem, Bethlehem Bible College, Naser Alawy on November 2, 2014 by Dean Allen.